Autopsy have always been a band that have been held in high regard by metal fans. Even when they had their ten year hiatus from extreme music, they left a gap hardly anyone felt comfortable filling, so when they returned with the triumphant Macabre Eternal; an album that was filled with malice, hate and quiet confidence, I was uncertain if Autopsy would be able to delve even deeper into their bloodthirsty souls and emerge triumphant once more. The Headless Ritual is something of a treasure. It is far more of a slow burner than Macabre Eternal which was filled with sludgy, punishing riffs and songs such as ‘Sadistic Gratification’ that you endure rather than listen to as you feel dirty and violated to hear a woman pleading for her life to manic screeches of laughter. The Headless Ritual is, as one of my friends put it, essentially an alternate soundtrack to a 70’s Zombies B movie. It reeks of horror, disgust and filth and though you should walk away, you are seduced by the grimy guitar tones and the rasping vocals of Chris Reifert. He sounds like he has the flu, but that only adds to the terror of the album and the entire impression that it is wholeheartedly unclean. The first track ‘Slaughter at beast house’ is like being out through a meat grinder. It churns away in true Autopsy style with odd, but solid guitar harmonies, thrash drums and sickening vocal lines. It has a number of breakdowns that add to the malice of the track and hint more at funeral doom than visceral carnage, but it all works. It is exactly what you expect from a band as seasoned as Autopsy, but their trick is that they haven’t stopped trying to find new ways to ravage their listeners. They never re-tread old ground, much like Deicide, who have addressed the same topics throughout their career, but never repeated themselves. Another stand out track that effectively makes the skin crawl is ‘Coffin Crawlers’. It sent chills through me when I first listened to it. The riff is the image of panic in a horror movie and as the solitary guitar is joined by other guitars in the perplexing harmonies that Autopsy are notorious for, the tension rises until you can’t bear it any longer and the rest of the track trundles along further into jeopardy and satisfaction. Chris Reifert outdoes himself in terms of vocal performances and is startling with his screams and choked groans. The beauty of this song and overall the album is that there is so much going on. Aside from those lurching guitar harmonies and jarring solos, there is a solid base of chuggy riffs, impressive drum patterns and enthusiasm which carries the songs forward. It is far more sinister, and sounds like Macabre Eternal’s older, more dangerous sibling. ‘When Hammer meets bone’ is another fine example of the Autopsy formula with thrashy, technical drums, gasping, choked vocals and guitar harmonies that sing out over the rest of the deluge. The single ringing guitar notes just halfway through the track sound bizarre, but they work, which I think is a big contributor to Autopsy’s enduring status. Chris growls and hisses throughout the track and it makes your hair stand up on end as the guitars descend once again into the domain of horror-soaked sludgy doom and make the listening experience a harrowing one. The concluding album track ‘The Headless Ritual’ is an instrumental and displays the individual musicians in Autopsy as artists within their own rights. They function exceedingly well as a unit and that is why they can get away with grating harmonies and odd time signatures because they function together so well and this great album is a tribute to that discipline. Ultimately, the album is a solid creation of sickness and sinister goings on and excels in everything that Autopsy have brought to the genre of death metal. The technicality of their work is as always brilliant, as is their ingenuity at experimenting with guitar harmonies, vocal patterns and drum accents to create something that should give you a headache with its surrealism, but beneath all the madness is something of an enduring classic. It is an album which will satisfy the most loyal of Autopsy fans, as well as appealing to fans perhaps only just discovering the genre with its raw subject matter, technical musicianship and variety of genre. 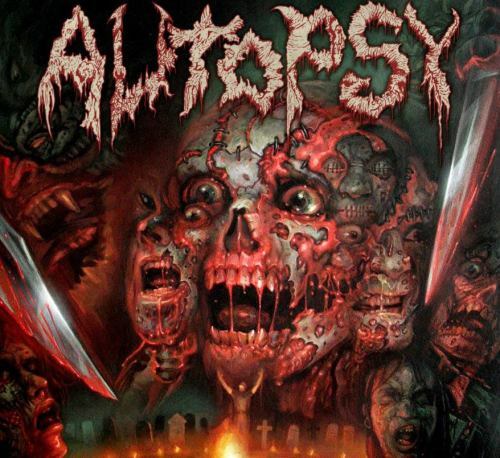 Among the early breed of US death metal pioneers, Autopsy formed in 1987 in the San Francisco bay area and released four albums on Peaceville Records. Beginning with the classic debut Severed Survival in 1989, they disbanded in 1995 with members going on to form Abscess. Autopsy triumphantly and officially returned from the grave after a 15 year hiatus with the 2010 EP, The Tomb Within, followed by the release of the band’s widely acclaimed fifth studio album, Macabre Eternal in 2011. ‘Fractured In The Timeless Abyss’ is the debut album from Resurgency’s “label-mates”, the American death metal band Ectovoid. Straight from the opening riff of ‘Transcend Into the Moonless Night’ it’s clear that this is brutal death metal. The vocals are the stereotypical, Morbid Angel -style guttural growls whilst the guitars have a certain dry, droning quality about it which is similar to Autopsy. This pretty much sets tone and the overall pace for the rest of the album where each track offers more of the same, skilfully executed but ultimately average sounding death metal. Don’t get me wrong, there’s nothing particularly bad about it. There’s some good tracks on here such as: ‘Dark Clouds of Conciousness’ which draws the attention towards the drums and the somewhat bizarrely named ‘Chewing Through the Membranes of Time and Space’ which features some thrash metal guitar solos making it stand out. Another noteworthy track is the Autopsy-esque, death metal-meets-doom with hits of thrash metal ‘Locked In Dismal Gaze’. Then there’s some surprises such as the short, piano ending to ‘Splintered Phantasm’. Overall, the main issue here is that there’s really not much variation between the songs.